OCTOPUS TRAVEL is an online travel service that offer great deals for travellers wanting 5 star treatment on a budget. Octopus is an innovative, international online travel company offering instant confirmation at over 19,000 hotels and up to 80% off the normal price. At Octopus Travel you can choose from budget to 5 star luxury – plus cost effective self-catering apartments and villas. All prices are in Australian dollars and you can organise your transfers from airport to hotel, book a train trip or even sort out your sight seeing, all in the comfort of your own home or office. OCTOPUS TRAVEL is fully secure so your privacy and payments are completely safe, as the many thousands of clients every week can confirm. 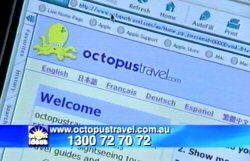 Plus Octopus Travel owns their own inventory so they can often confirm bookings when others cannot. OCTOPUS TRAVEL is a simple to use website with instant confirmation and unbeatable prices. So if your planning that long awaited trip why don’t you log on today.